As a beginner in your career or an experienced professional, you must have been asked by your HR & Accounts Departments for Rent Receipts. That’s the time when you start making the so called jugaads with the help of your friends, relatives, colleagues or seniors to get rent receipts. Most of the employees face difficulties in understanding the purpose of rent receipts or how to properly utilize them for tax benefits and sometimes even make the fake receipts to avail the tax benefits. Since providing these rent receipts to accounts department or HR department has become a ritual that we perform once a year, but we never bothered to get in-depth understanding of rent receipts. Whatever the situation be, we are addressing all your concerns in this guide to make sure you never face difficulties on rent receipts after reading this guide. So, What are rent receipts exactly? 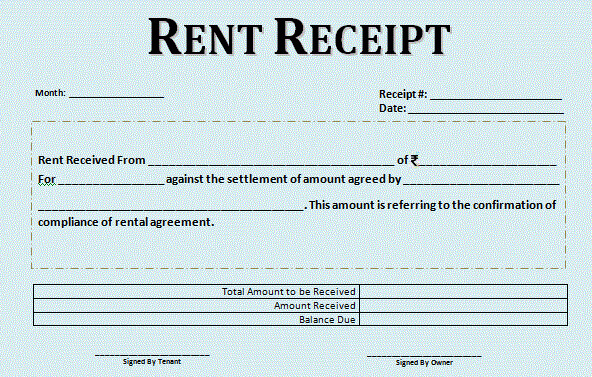 What are the elements of a rent receipt? Where to get the rent receipts from to be submitted to the HR department? Why I am required to submit rent receipts to the HR Department? What to do when your landlord refuses to give his PAN? How payment of rent helps you in saving taxes? What if I forgot to submit rent receipts at the time of declaration? How to claim HRA exemption at the time of filing the ITR? Who can claim HRA exemption ? How HRA is exempt for Income Tax? Can I pay rent to my parents and claim HRA? Can I claim HRA and home loan? Can HRA be claimed for paying rent for 2 houses? Can HRA be claimed by both husband and wife? Can I use my electric bill as a tax deduction? Well, this is not a weird question to ask but a relevant & important question. One should have understanding of rent receipt in terms of logic and its economics. 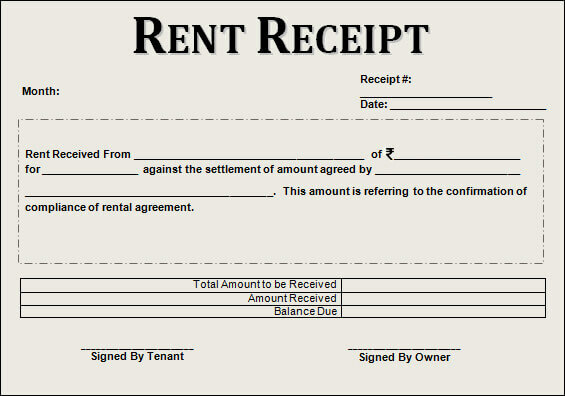 A rent receipt is a proof of transaction of rent paid by a tenant to his/her landlord. 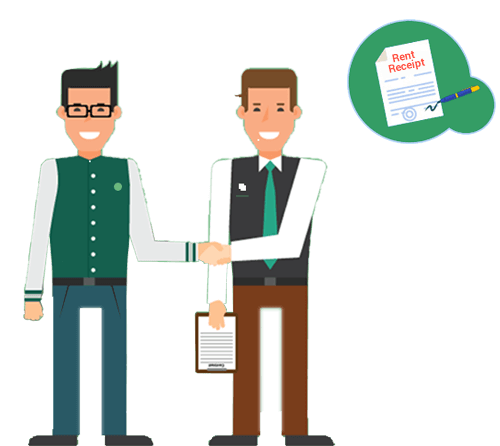 Rent receipt(document) is provided by the landlord upon receiving the rent from rentee and his signatures are placed on the it. If you have received the rent receipt, you should keep them with the documents you care about. Rent receipts can be used for legal matters( in case any) or tax benefits if you are eligible. India being a vast country having multiple languages, methods to document transactions, and different formats used by receipt books publishers, we have many formats/designs available in market. Professionals/Employees often gets confused due to these different formats available. For the convenience of our users, we are providing a facility to customise and download free printable rent receipts(valid format) from our rent receipt generator tool. Now comes the question , what is the actual benefit of Rent Receipts ? Many companies provide House Rent Allowance(HRA) to employees for meeting the cost of living in a rented accommodation. HRA is one of the biggest tax saving avenue as the complete amount of HRA is not taxable. In order to give you the benefit of HRA, the HR department needs to verify whether you have actually paid rent for allowing HRA tax exemption. 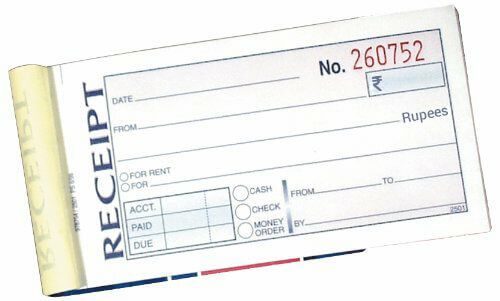 Rent receipts act as a proof that you have actually paid the amount and not showing any fake expenses to save tax. Is rent receipt mandatory for claiming HRA? If employee receives HRA in excess of Rs. 3000/- per month, it is mandatory to provide Rent receipt to employer as an evidence for claiming HRA. Even if your HRA is less than Rs. 3000/-, try to keep rent receipts with you in case Income Tax Officer asks for them at a later date. I am sure you would agree with me when I say the landlords do not give the rent receipts even after paying the rent. So, what do we do in this situation ? Simple just give the filled rent receipts to your landlord and ask him to sign them to acknowledge the receipt of rent. As per the Income Tax law of our country every person who pays salary is required to deduct tax at source(TDS) , deposit with the government and then pay remaining amount to the employee. During this process if any employee makes a tax saving expenditure then the person responsible for deducting tax, has to consider and give benefit of that expenditure and then deduct the tax on the net amount. Practically, it has been observed that people submit fake rent receipts, even when they are not living in a rented accommodation. So, to counter this, HR departments have started asking for rent agreements for giving HRA benefits. Rent agreement should be on Rs. 500 stamp or as per the stamp rate prevailing in your state . It can be entered into for 11 months only. For more than 12 months, the rent agreement is not entered into instead lease deed is to be preferred which needs registration. Every year, the rent agreement is renewed after 11 months with the increased rent. Both landlord and tenant are required to serve the notice period as stated in agreement. A revenue stamp is required to be affixed on rent receipts if cash payment is more than Rs. 5000 per receipt. If rent is paid through cheque then revenue stamp is not required. The rent receipts for all the months for which you are claiming HRA is required to be submitted. If the annual rent paid exceeds Rs.1,00,000/- it is mandatory to report PAN of the landlord to claim HRA exemption.If landlord refuses to give his PAN, then you cannot claim HRA for the rent paid in excess of Rs. 1,00,000/- and your employer will deduct the TDS accordingly. First of all my friends do not ask for the copy of the PAN Card, all you need is the PAN No. In Case, your landlord does not have a PAN card then take a declaration from him for the same and submit to your HR. Prevention is better than cure, when taking a house on rent talk to your landlord in advance for sharing his PAN no. A, B,C whichever is lower is to be selected as exempted HRA. Condition B : You can still claim the tax benefit of HRA at the time of filing of return as HRA is a part of your CTC.The only notional loss you will have to bear is more amount of TDS will be deducted during the year. Condition C : If HRA is not a part of your CTC , don’t be disheartened. You can still claim the deduction of rent paid at the time of filing return u/s 80GG but upto Rs. 60,000 only. Even if you forgot to submit rent receipts, you can still claim HRA while filing IT return. All you need is Rent receipts only. Step2 : Deduct the amount of exempt HRA from the Income Chargeable under the head salary [column 6 of your Form 16, Part B]. Step3: Enter the amount calculated in Step 2 under Income From Salary /Pension. For instance your Gross Salary from Form 16 is 8,00,000 and you have HRA exemption of Rs. 1,20,000, So instead of showing Salary income Rs. 8,00,000/- in ITR1 fill it as 6,80,000/-. 1. You are a salaried employee. 2. 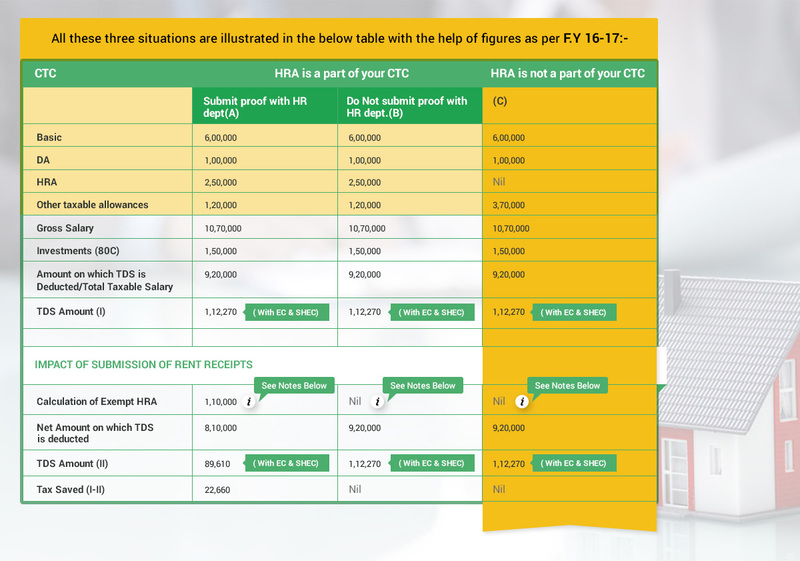 You receive HRA as a part of your salary package/CTC. 3. You live in a rented accommodation. Although HRA is a part of the salary, but unlike basic salary it is not fully taxable. A part of HRA gets exempted under Section 10 (13A) of the Income-tax Act, subjected to certain conditions. The amount of exempted HRA is deductible from the total income before arriving at a taxable income. Yes, certainly. You can claim both. If you are staying in a rented house, then you are eligible to claim HRA tax exemption. Simultaneously, if you have taken a house loan then you can claim the house loan benefits too. If you have bought a house with the help of a home loan and live in another house on rent, you can claim tax benefit for both. But if the house you bought and the house you live in are in the same city, you should have a genuine reason for not living in the house that you own, to prove to Income Tax Officer. The reasons could be that the house you own is too far from your workplace, or the commute is very difficult. No, you cannot enjoy the tax benefits of HRA if you live in your own house. One cannot pay rent to oneself. Hence, no exemption is available for HRA and the whole of HRA received becomes taxable under “Income from Salary”. But if you reside in a rented property, then you can claim exemption even if you own a house (in the same city or in a different city). This could be possible only when you live in both the houses in a particular year for proportionate months. In case of LTA , the employer reimburses the travel expenses for the vacation taken by an employee. However, any other expense such as food, shopping, lodging etc. is not included in the exemption. Available for only two children of an individual, born after October 1st, 1998 including a step or adopted child. Travelling Twice in a block of Four years is allowed. The current block is 2014-17. Mode of travel should be air, rail or any other public mode of transport. Normally, Tax benefit of HRA cannot be claimed by paying rent to your spouse. So, if you are staying in a house owned by your spouse then HRA exemptions are not available to you. However, if you still wish to claim exemption, you should be ready for litigation as Income Tax Officer might have different view. There is no tax deduction in respect of electricity bill. However, if you are in business then you can claim the same as your business expense. Sec 10 includes those incomes which do not form part of total income i.e. exempt income. Like agriculture income, specified interest income, Dividend Income etc. HRA or House Rent Allowance is an allowance which salaried individuals receive from their employer for meeting the rental expenses of their house. The amount received is partly exempted from tax, for the employee who are residing in a rented house. In case the employee lives in his/her own house and does not pay any rent, the entire amount would be taxable. Points to Remember: For claiming HRA exemption you need to submit the rent receipts as a proof of rent payment to your HR/Accounts department. 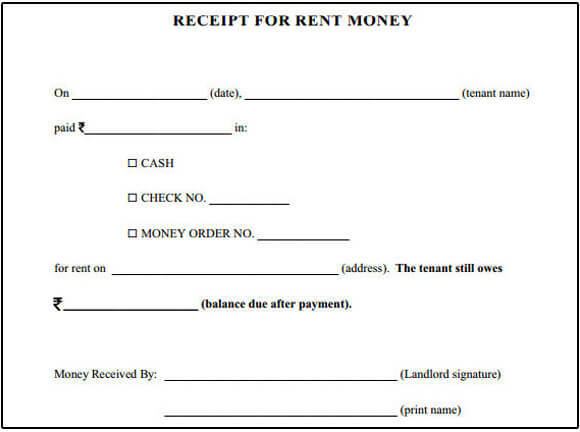 There is no set format for rent receipts prescribed. If paying rent more than Rs. 5000 in cash then ensure the revenue receipt is affixed with the revenue stamp. If the annual payment of rent exceeds 100000, then you need to report the PAN No of your landlord. If you forgot to submit the rent receipts at the time of proof declaration you can still claim the benefit of HRA exemption at the time of filing your Income Tax Return (ITR).